WHO is mobilizing 510,000doses of oral cholera vaccine to help control the cholera outbreak among high-risk groups. The World Health Organization (WHO) announced today that it would start vaccine treatments for cholera beginning this weekend to prevent further outbreaks in Iraq, where the disease has now been confirmed in 15 out of 18 governorates, while the agency also reported a suspected case was also found in northern Syria. WHO spokesperson Christian Lindmeier told the regular press briefing in Geneva, Switzerland, that the latest laboratory tests had confirmed 1,942 cases and two deaths in 15 out of 18 governorates in Iraq. “On 31 October, WHO will begin, in conjunction with the Ministry of Health, the oral cholera vaccine treatment, and will use 510,000 of the global stock pile to ensure that 255,000 internally displaced persons and refugees in the affected areas will receive two doses,” the spokesperson said. In addition to the vaccine campaign, diarrhoeal disease kits and 600,000 chlorine tablets had been distributed in the infected areas, 48 national health staff had been trained in cholera and laboratory procedures, and a team of international experts have been deployed to assist the Iraqi’s Ministry of Health, he said. Regarding Syria, the WHO spokesperson said his agency had received reports of a suspected cholera case in rural Aleppo, northern Syria, involving a 5-year-old boy, who had died before an appropriate stool sample could be taken for confirmative testing. Aleppo is where pro-Government forces and non-State armed opposition groups have continued mutual shelling inside civilian-populated areas. WHO is printing 50,000 information brochures for Syria, and the country’s health sector has been put on alert, the spokesperson said. Health education is ongoing and the water network in the area is said to be chlorinated, which will hinder the spread of the cholera. Cholera is an acute diarrhoeal infection caused by ingestion of food or water contaminated with the bacterium Vibrio cholerae. The short incubation period of 2 hours to 5 days, is one factor that triggers the potentially explosive pattern of outbreaks, according to the health agency. 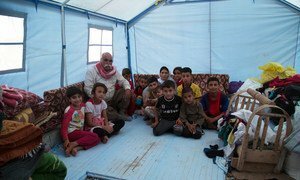 The humanitarian situation in Iraq is deteriorating and growing more complex, as conflict protracts, coping capacities diminish, and funding falls short, according to a report issued today by the United Nations Office for the Coordination of Humanitarian Affairs (OCHA).